Five years ago, I relocated from a lifetime spent in blue centers of blue states to a red dot in a red state. The move saved my soul, and this is an atheist writing. I find the culture in my new home far superior in every way — intellectually, philosophically, morally, politically, artistically, and romantically. The people here learned from childhood how to hunt, fish, farm, build, make a home, live in the wilderness, defend themselves and loved ones, sing, dance, perform theatre, play music, create fine art, and become masculine men and feminine women, while blue-metropolis ignoramuses like me were watching TV and doing I don’t know what. The farmers and computer programmers I have met here seem more well-studied on the political foundation of our nation than were the humanities professors I had at Cornell and MIT — and more well-studied than I, a published writer on politics. The first neighbor I met, a college student and carpenter almost young enough to be my grandson, owned a more extensive library of books on philosophy than do I, a published philosopher. I feel as though I have stowed away on a UFO and been brought to a more advanced civilization, and that I will have to work the remainder of my life to try to catch up in knowledge and ability compared to those around me. The cause of the superiority of the society I now live in is, in my judgment, that contemporary Judeo-Christian Conservatism (which I will abbreviate as ‘contemporary Conservatism’) is far superior to postmodern Leftism. The difference between these two cultural forces begins with basic philosophy regarding the nature of the world, of man, and of how man comes to know the world. Here is a telling passage written in 1980 by Richard Rorty, a famous philosopher who himself was an arch-Pragmatist, Leftist, and fan of arch-egalitarian John Rawls. Since Kant, philosophers have prided themselves on transcending the ‘naive realism’ of Aristotle and of common sense. On this naive view, there is a right way of describing things, corresponding to how they are in themselves, to their real essences. Scientists, philosophers like to say, are especially prone to adopt this unreflective view. They think they are discovering the secrets of nature, but philosophers know that they are really constituting objects by synthesising the manifold of intuition, or predicting the occurrence of sensations, or wielding instruments to cope with the flux of experience, or something equally pragmatic and anthropocentric. This condescending attitude towards common sense, Aristotle and science has been shared by people as far apart as Russell and Bergson, Whitehead and Husserl, James and Nietzsche, Carnap and Cassirer. Until Kripke came along, almost the only exceptions to this consensus were the Catholics and the Marxists. Today, thirty-seven years later, fewer intellectuals call themselves Marxist, mainly because they have become more ‘pragmatic’ and less ‘ideological’; that is, like their fellow Kantians, they eschew identifying themselves in terms of essentials or principles. Saul Kripke, mentioned above by Rorty and widely considered the most important philosopher alive today, did much more to bury the elaborate schemes of his post-Kantian comrades than to praise Aristotle or reason. On the other hand, Catholics are not the only Christians to embrace Aristotle, but we cannot expect Rorty — a postmodern Leftist — to have understood Christians that well. He sure had his own kind pegged, though. The philosophy of Immanual Kant (1724–1804), the most influential philosopher since Aristotle, was an attempt to answer the skeptic philosophy of David Hume (1711–1776). According to Hume, there was no reason to believe in a law of causality; for instance, just because objects have always behaved in the past as if there were a law of gravity causing them to fall to the ground, there is no reason to believe that objects will obey such a law of gravity in the next moment. Kant agreed with Hume that we cannot know the real world or how anything in the real world will behave. But Kant added a new wrinkle: he argued that each human mind constructs a subjective world, and this subjective world is the world that each of us ‘knows’. Thinkers in the Kantian tradition claim to have used reason to draw this subjectivist conclusion. Thus, while claiming to be rational, these thinkers deny that reason has efficacy. They claim to have used reason to ‘prove’ that using reason is futile, that reason is not an effective means of acquiring knowledge or of guiding human action. Postmodern Leftism is based on this Kantian tradition. A variant of this postmodern answer, embraced by Karl Marx and many contemporary thinkers in contradiction to directly observed fact, is that none of us has free will anyway; we have no choice but to follow our emotions, or our blood (per the Nazis), or the programming of our brain. Here is another variant, originated by Kant himself and embraced by many in the school of philosophy known as Pragmatism. The way to ‘know’ that the ‘reality’ constructed by one mind is ‘true’ is to see whether other minds have constructed the same reality. That is, ‘true’ reality is known only by the collective. Here is yet another variant, developed by the philosophy of Pragmatism and embraced by Barack Obama. The way that our mind puts reality together keeps changing; therefore, there are no enduring truths, no fundamental ‘ideologies’ to guide us. What worked for the past hundred years may not work tomorrow. We just have to keep trying new things to see what works now. Alinsky’s exhortation to “use the wrong reasons” — that is, lie — “to achieve the right goals” permeated the Obama administration, as revealed by Jonathan Gruber regarding Obamacare, Hillary Clinton regarding Benghazi, and Ben Rhodes regarding the “deal” with Iran. The problem for Kantians is that none of them has succeeded in this quest. As a result, the skepticism inherent in Kantianism has become more and more pervasive, attacking every aspect of knowledge and every value held by Western civilization. In denying the nature of man as a being of efficacious reason, postmodernism denies the basis for the individual right to liberty. Moreover, if reason is futile and knowledge is a delusion, then no individual’s independent thinking is responsible for the individual’s success or failure. On the same anti-reason basis, postmodernism denies that romantic love is a response to rational values, and instead considers sexuality mindless. In denying the distinct nature of men and women, postmodernism denies masculinity and femininity, and denies marriage as a union of opposite sexes. In denying that success and happiness are possible through understanding the world and thereby commanding nature, postmodernists create ‘art’ that is unintelligible, bleak, and deliberately ugly. All of these traits of the postmodern Left emanate from the rejection of reason. Here we have a grand irony. Many postmodern Leftists deride contemporary Conservatives for religiosity, because Leftists consider religiosity contrary to reason. But postmodern Leftism is contrary to reason in every way. In contrast, much of contemporary Conservatism is an explicit defense of reason. Contemporary Conservatism is an inconsistent mixture of religiosity (which is indeed, in my judgment, contrary to reason), Aristotle, and Enlightenment thought. While Obama and Hillary Clinton study Black Liberation Theology and Alinsky, popular Christians such as Ted Cruz and Glenn Beck study not only the Bible but also John Locke, Thomas Jefferson, Ludwig von Mises, and Ayn Rand. And I want each of you to personally think for a minute and rediscover what it means to be Conservative. We are dedicated to the Constitution and its principals not because we cling to our Bibles and our guns. We are dedicated to the Constitution and its principals because we are clear-minded. Because we are rational. Because we have the courage enough to recognize the self-evident truth: That mankind, by his nature, has a God-given identity. [Applause.] That we are endowed by our creator with inherent, unalienable rights. They are ours simply because we exist. If you don’t understand why the Constitution matters, then you’re the one who’s confused. You don’t understand the nature of man. How can you look at yourself in the mirror and not see who you are? You are a sentient being. You’re born with free agency. You’re capable of choosing right from wrong, morality from immorality. The world tells you that you are powerless, that you need government programs and rules and edicts. I tell you that you are the most powerful being ever created. When we say we are dedicated to the eternal principals of the Constitution, that is what we mean: We recognize and embrace mankind as the powerful beings we are. Man is who he is. A is A. The influence of Aristotle and John Locke — and perhaps even Ayn Rand — is evident in this passage, which contains ideas explicitly denied by the postmodern Left: that entities have a nature, that man’s nature entails the faculty of reason, that reason is efficacious, that there is a right and wrong that man can choose via his free will and according to his reason. 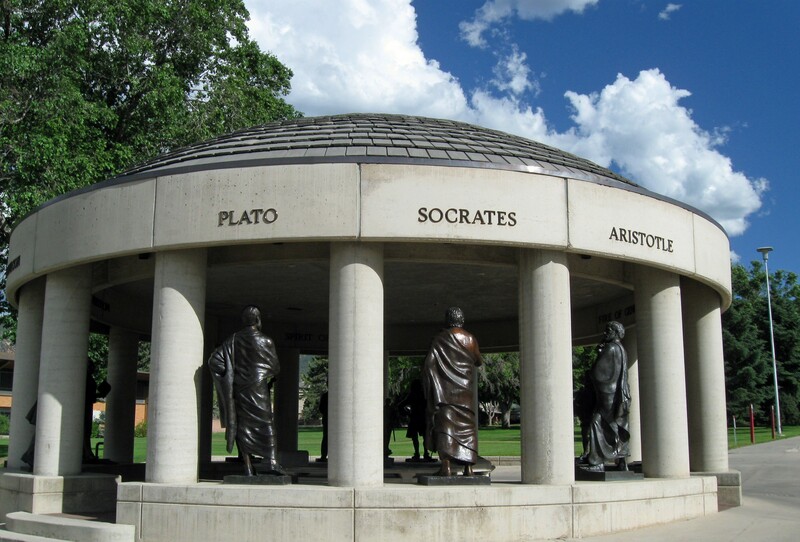 The College considers itself a trustee of modern man’s intellectual and spiritual inheritance from the Judeo-Christian faith and Greco-Roman culture, a heritage finding its clearest expression in the American experiment of self-government under law. The American Founders wrote a Constitution that established a government limited in size and scope, whose central purpose was to secure the natural rights of all Americans. Again we see the Aristotelian idea that things have a nature, and the Lockean idea that man’s rights are based on man’s nature. Productiveness is your acceptance of morality, your recognition of the fact that you choose to live — that productive work is the process by which man’s consciousness controls his existence, a constant process of acquiring knowledge and shaping matter to fit one’s purpose, of translating an idea into physical form, of remaking the earth in the image of one’s values … . The above passage is consistent with Francis Bacon’s aphorism, “Nature to be commanded must be obeyed.” How many postmodern Leftists, most of whom are environmentalists, would support Bacon’s aphorism or Ayn Rand’s call for “remaking the earth in the image of one’s values”? In contrast to the dogmatic stagnation of the Islamic world, science was able to flourish in Christian Europe during the same period because Christian scientists were working from assumptions derived from the Bible, which were very different from those of the Qur’an. The Bible assumes that God’s laws of creation are natural laws, a stable and unchanging reality — a sine qua non of scientific investigation. I do not agree with Spencer’s charitable assessment of the Bible, but the point is that many if not most contemporary Conservatives hold this respect for laws of nature knowable through reason. The Judeo-Christian tradition of today is not the Judaism and Christianity of the Bible or the Dark Ages. Thomas Aquinas (1225–1274) rediscovered the pro-reason philosophy of Aristotle and incorporated this philosophy into the Christian tradition. As a result, Western civilization had a Renaissance, an Age of Reason, and an Enlightenment. For half a millennium, from Aquinas until Hume and Kant, reason was winning out against blind faith among people who yet believed in the Judeo-Christian God. It was Hume and Kant, not some Christian idea, that knocked the West off course in becoming fully rational. There is a second irony to the derision by postmodern Leftists of the religiosity of contemporary Conservatives. If religiosity is understood as mystical faith, then the postmodern Left is at least as religious as Christian Conservatism. The Left does not oppose religion and mysticism as such, but rather the Western Judeo-Christian tradition in particular, the least mystical religion today because of its infusion of Aristotle via Aquinas. The Left supports all other religions and mystical beliefs: Islam, Buddhism, Eastern religions, all kinds of ‘New Age’ fads, and — that most primitive and mystical of all Western religions — environmentalism, a modern form of animism. That is, Obama asserted that Muhammad is a messenger of God, and that anyone who denies this assertion is committing slander. Note also that Obama made that statement as his main response to a foreign attack on and murder of Americans. That is, Obama based his Leftist foreign policy of capitulation — responding to our theocratic enemies by undercutting free speech of Americans — on adherence to absurd religious doctrine. As for Hillary Clinton, she took two main actions in response to the attacks in Benghazi: she worked to silence a Christian pastor, and she worked to get the maker of the anti-Muhammad Youtube video thrown in prison. Like Obama, she supported absurd religious doctrine and repudiated free speech of Americans, in response to a murderous attack on Americans. our individual salvation depends on collective salvation. The notion of ‘collective salvation’ comes from Black Liberation Theology, espoused by Obama’s long-time pastor Jeremiah Wright. That is, Obama based his Leftist welfare-state policy on absurd religious doctrine. He advocated welfare-statism as a means to get in good with God on Judgment Day. These positive assessments of Obama are mystical ideas, a belief in a mind with capabilities and knowledge beyond one’s own ability to conceive of, a mind that somehow knows what to do about everything. When asked whether they agree with a particular Obama policy, Leftists often reply that they have faith in Obama, that Obama must know what he is doing. Obama. Period. When a meme goes out from an accredited Leftist source, the Leftists re-post it en masse. Leftists in public office and in the electorate vote en bloc. Leftists deduce that if a Leftist leader is for something, then that something must be right. Again, the Left is just as religious as contemporary Conservatism, if not more so, with two differences. First, the Left has more favorable press. Second, and more importantly, the Left has taken all the premises of the Judeo-Christian tradition, thrown out all the good stuff incorporated from Aristotle and the Enlightenment — reason, objectivity, individualism, capitalism — and retained only the evil: mysticism, subjectivism, sacrifice of the individual, collectivism, and even theocracy. The Left is like the Christianity of the Dark Ages. Contemporary Conservatism is a mixture of conflicting elements: faith and reason. Because of this conflict, specific Conservatives range widely in their method of thinking. Some individuals rely primarily on faith, adhering to the words of scripture because it is scripture. Others rely primarily on reason, resorting to faith only when their reasoning does not seem to give them an answer. Some even heed the famous advice by Thomas Jefferson to “Fix reason firmly in her seat, and call on her tribunal for every fact, every opinion. Question with boldness even the existence of a God; … .” Postmodern Leftism, in contrast, is more uniformly against the efficacy of reason. Here is the clearest giveaway that today’s postmodern Left is much more anti-reason than is today’s Conservatism: Who today defends free speech, and who attacks it? I already gave the examples of Obama and Hillary Clinton attacking free speech in the Benghazi incident. The Left attacks free speech expressed on the Internet and on talk radio. The Left wants to outlaw ‘hate speech’ and ‘Islamophobia’, and has already done so in Canada and much of Europe. The Left, as a matter of routine, forcibly shuts down speakers on college campuses. And note the latest absurdities on college campuses regarding ‘micro-aggressions’ and ‘safe spaces’. The Left wants to make it a crime to deny ‘climate change’. To the Left, science is ‘settled’, and it is heresy to argue otherwise. These Leftist policies attacking free speech occur whether Republicans or Democrats hold political office. The Left is systematically and consistently seeking to destroy rational inquiry and rational discourse. That is, the Left is the side that wants to outlaw reason. Contemporary Conservatism and postmodern Leftism are, in effect, two reactions to the program of Kant “to deny knowledge, in order to make room for faith.” Unable to validate certain basic ideas against the attack from Kant — such ideas as the validity of reason itself — contemporary Conservatism resorts to faith in these basic ideas, yet continues to use reason regarding everything it can validate. The most influential Conservatives tend to be the most rational ones, the ones who use reason the most and faith the least. The Left, on the other hand, uses a form of reason only in the attempt to complete the Kantian program of invalidating reason in every field, on every question. In short, contemporary Conservatism accepts Kant grudgingly and as little as possible; the Left accepts Kant enthusiastically and as much as possible. Here, in a sense, is the bottom line. Contemporary Conservatism, by relying on a belief in God, is an absurd defense of the wisdom of the Enlightenment; postmodern Leftism is a rejection of that wisdom. It is far better to believe in the mind of God than to deny the mind of man. It is far better to believe that man was endowed by his Creator with the efficacious faculty of reason than to deny the efficacy of reason. It is far better to believe that individual rights come from God than to oppose individual rights. It is far better to believe in the eternal soul than that there is no soul. It is far better to believe that God will judge you for your choices than to deny that man has choice. It is far better to believe that masculinity, femininity, and sexuality glorify God than to oppose masculinity and femininity and to believe that sexuality is mindless. Here is another bottom line. If America were to dissolve, the Conservative states of Utah and Texas would probably survive and thrive. The Leftist states of New York and California would probably descend into barbarism. Contemporary Conservative ideology, with all its flaws, is on balance auspicious to human life and to continued intellectual and material progress. Postmodern Leftism is a dead end, intellectually and literally. Postmodern Leftism is what happens when the disease of Kant runs rampant. Contemporary Conservatism, in contrast, is like a cryogenically frozen ideology, using Judeo-Christian faith to preserve the ideas and culture of the Enlightenment, waiting for a cure for Kant to come along. In my judgment, the basis for a cure has arrived, in the form of the philosophy of Ayn Rand — an improvement of Aristotle able to withstand the attacks by Kant without appealing to faith. As more Conservatives learn this philosophy — not only the political aspects but also the aspects dealing with the nature of the world, of man, and of knowledge — then the cryogenically frozen ideology of Conservatism will gradually thaw. Ronald Pisaturo is the author of three books: The Merchant of Mars; Masculine Power, Feminine Beauty: The Volitional, Objective Basis for Heterosexuality in Romantic Love and Marriage; and The Longevity Argument: The Doomsday Argument is wrong, and logical induction has a philosophical basis. Ron has written on epistemology, esthetics, romantic love, politics, and the philosophy of mathematics. Part of Ron’s work on solving the centuries-old ‘problem of induction’ was published in Philosophy of Science, a leading peer-reviewed journal of philosophy. Articles by Ron have appeared in The Federalist, The Intellectual Activist, Barron’s, Capitalism Magazine, many newspapers, and his own blog. Ron is the author of three books: The Merchant of Mars; Masculine Power, Feminine Beauty; and The Longevity Argument.